We are proud to say that we have no "bunk beds" out of RESPECT to you. Who wants to travel for a relaxing vacation and sleep in a dorm-like setting. FULLY SCREENED!!!!! ; Including a porch to help insure that MOSQUITOS can not enter. Open concept floor plan with high 17 foot (5.2m) teak ceilings and large airy windows encompasses the living dining and kitchen areas and joins with a screened porch. Salt water pool centered in a lush palm setting, surrounded by shaded rancho, breeze-catching second story Mirador, and screened porch. Poolside space for hammocking, lounging and yoga. We built this home on a small hill after carefully observing how to maximize the sun and wind to provide comfort and cooling. We spent time over many years in Playa Guiones surfing, fishing, relaxing and getting to know many local residents. Joe designed the home and has invested his heart and skill in landscaping. We hope to spend more time in the house as we 'mature' and can afford to work less; so it was really built to 'live in' rather than as a rental property. WE take pride in keeping the house updated, clean and well functioning, fully stocked with kitchen supplies and linens. Fortunately we have a very attentive property manager, AnnMarie, who will rapidly respond to any of your concerns. THE WAVES ARE CONSISTENT, 300 METERS FROM PACIFIC OCEAN, GOOD LOCAL VIBE. We built the house in Playa Guiones after coming here to surf and relax for many years. The flora and fauna always provide new experiences. PURA VIDA. PERFECT WEATHER, WAVES, GREAT WALKING/JOGGING BEACH, FRESH FOOD. We landscaped with lush tropical and native plants to encourage birds and monkeys to visit We planted fruit trees and herbs so that you could enjoy as much fresh local food as possible. Help yourself. All, just steps from the Pacific Ocean. The housekeeper may be hired to do laundry at small charge. The housekeeper may be hired to do laundry at a small charge. Open floor plan, extensive counter space. Efficient layout for family style cooking. Native hardwoods throughout. The grounds are a garden. Native and pan-tropical trees and shrubs attract birds and monkeys. Flowers, fruits and herbs grown for your pleasure. Large Second story porch(mirador) ideal for yoga, cocktails, watching the sunset or just hiding away in a hammock. Poolside Rancho with hammock provides another private haven. In-house security safe for valuables, 2 outdoor showers, screened porch, extra maid service, babysitters available through property manager. Had a great week in Playa Guiones staying here. The house is clean, functional and a 5-minute walk to the beach. We had a large group and booked this house next door (Rancho Paloma Azul) and it worked great. This house has three bedrooms / 2 bedrooms included in the rental. They are simple, but work great. Also, there is a functional kitchen and living area. The rental was very low key. We received a walkthrough of the house upon arrival (and they graciously accommodated our late arrival)... after that, they were available upon request. They offered a mid week clean, cook and other services, but we didn't need any of them. The location is about 5 minutes from the beach and 10-15 from town (depending on where you go).... we had a car, which we used when we needed to travel to the other side of town. Overall, I think the value was excellent. We were vey happy with our stay and I would recommend it to others. Great property, close to beach. Pool and AC in bedrooms are great. Definitely rent a golf cart to get around town. So close to the beach for surfing and tide pools! The house has everything you need; stays cool due to high ceilings and great ventilation. Bedrooms have AC. Kitchen well stocked. We got fresh pipas, chilis, oregano,cilantro and lemongrass and grapefruits from the yard. Casa Olaje is an amazing find. Our small crew of guys (4-5 depending on the year) has been using this location as our Costa Rican home away from home for years. Reasons include the owners are fantastic, the property management team is responsive, the place is immaculate and has an amazing amount of charm you just don't get with the massive structures now populating Nosara. The location is ideal to hit the beach, and just far enough from the main drag to get to easy enough via foot, car or bike while still offering some solitude. To keep you cool there is a pool that we have found to be a must have, and 2 outdoor showers to clean up from the beach. Safety wise its great, there is a 24 hour guard shack and plenty of safety features (heave door safe, bars on the windows elegantly placed) so you know your safe in or away. Costa Rica is a magical place, and Casa Olaje just makes it all complete. Totally recommend it and its worth a look! We loved our stay at Casa Olaje. We have two boys with a lot of energy. Because the house is only minutes walk from the Beach, the boys were able to swim, surf and explore Playa Guiones. Then, during the hottest times of the day, we could all hang in the shade by the pool at the house, in a hammock, or even just kick back inside the cool house reading a book. We were always careful, but also always felt very safe. We’re glad you found the house comfortable and perfect for a family of your size. We hope you will think of us the next time you come to Costa Rica. Clean and spacious house steps from the south end of playa guiones beach. Easy check in, no issues with house during our stay. We had a great time surfing, lounging by the pool and relaxing. ride a bike on it. You can snorkel in tide pools,fish and, oh yea, you can surf here too. Very good medical services nearby. 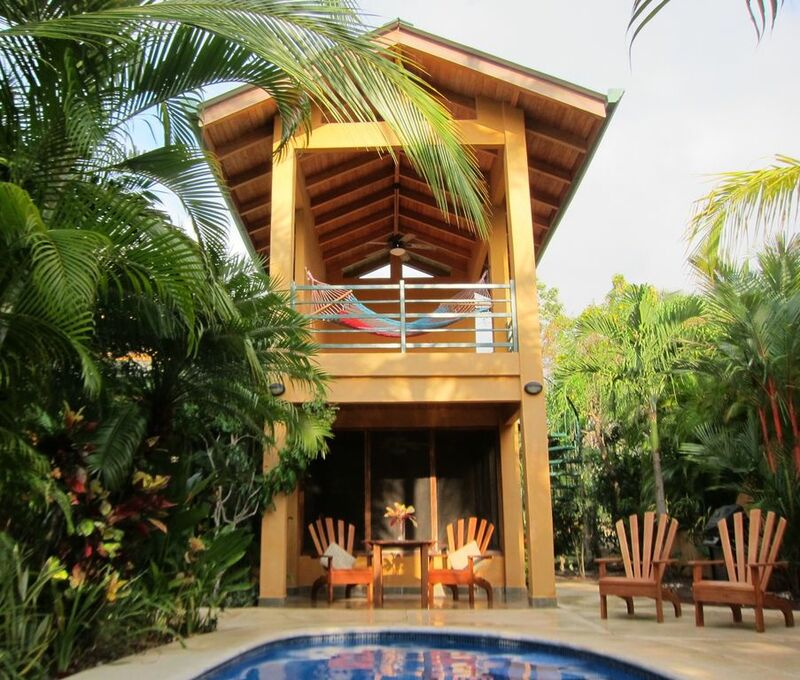 As of July, 2014 Costa Rica has mandated a 13% sales tax on all home vacation rentals. Please consider this and add it on to the daily/weekly fees.